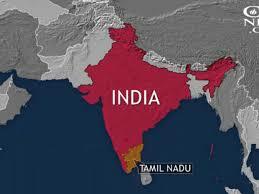 TAMIL NADU, INDIA (ANS) — A prayer meeting in a home in India’s Tamil Nadu state was disrupted on March 19 by approximately 15 people from the Hindu Munani (Hindu Front) and the Vishva Hindu Parishad (VHP), which is the religious arm of the RSS, a Hindu nationalist movement. Christian Solidarity Worldwide reports the prayer meeting was being held in the home of a Christian student named Siddappa, who lives in Kurubatti in the city of Hosur. Neethiraj of the India Evangelical Mission had visited the home of the student on March 19 to pray along with a friend named Chandrakant and his sick 16-year-old relative. CSW says that soon after the prayer meeting began, the intruders went upstairs and questioned the men about their purpose for gathering. The Christians were manhandled and dragged down the stairs and taken to the middle of the street outside Siddappa’s home. Neethiraj’s bag which contained Christian tracts was forcefully emptied on the street. The attackers also gathered all the Bibles and hymn books from Siddapa’s home. Local sources say that Neethiraj was forced to set the items on fire with petrol, which the perpetrators had extracted from a nearby vehicle, despite pleas from the Christians not to set the Bibles on fire. Nehemiah Christie, Director of Legislation & Regulations of the Synod of Pentecostal Churches in Tamil Nadu, said: “Any Christian gatherings are now at risk of being interrupted by Hindutva forces. It is worrying to see that such groups freely intrude homes, question one’s belief and seize articles of worship, including Bibles,and desecrate them. ** Editor’s Note: Many people in this region of India do not go by surnames, hence only first names are given.